(Newser) – In what may be the best unpaid ad Apple could hope for, a Brooklyn man says the company’s smartwatch saved his life. James Green, 28, was wearing an Apple Watch last week when he noticed his heart rate spiking, the Telegraph reports. The warning came courtesy of the HeartWatch app, which tracks a wearer's ticker. "Saw my heart rate go up, ended up being a pulmonary embolism," Green tweeted on Friday. 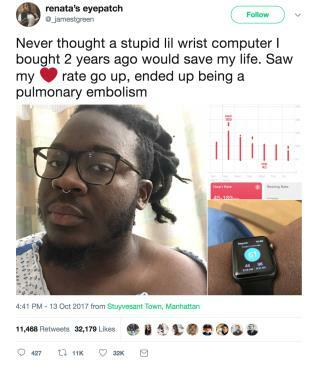 "Never thought a stupid lil wrist computer I bought two years ago would save my life." A blood clot in the lungs can kill quickly, the Telegraph notes. Green, a podcast reporter, says he was at home when got an alert from the app saying his heart rate was above its resting rate even when he was seated. I don't care who it's a plug for if it saves a life but I can't afford an Apple Watch. I wonder if a Fitbit would work or do they cost just as much. Oh look! A plug for crApple.